"Do you know that we are the only people in the United States who have to have their voting rights okayed every couple of years? Did you know that they have to vote on the Voting Rights Bill for black folks? Can we just, can one of you candidates- can we just take care of that so I don’t have to worry every year, my God am I not?" The show’s sole "conservative" Elisabeth Hasselbeck agreed "it’s ridiculous" and "something needs to be done." 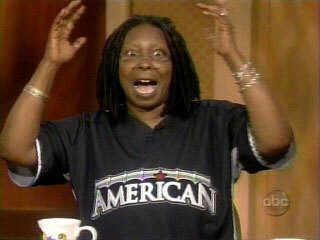 Before spouting such inflammatory charges on national television, Whoopi should check the facts beforehand. Responding to some rumors, the Department of Justice issued a press release clarifying the Voting Rights Act of 1965. Specifically, the 15th amendment to the Constitution prohibits racial discrimination in voting. The voting rights Act of 1965 enforces that Constitutional amendment. Because amendments to the Constitution do not expire, the 15th amendment is permanent. Additionally, most of the Voting Rights Act of 1965 is permanent as well. The few sections with limited time include "special provisions containing extraordinary remedies applied in certain areas of the nation for a limited time." Such provisions were renewed in 2006, but even if they did expire, according to the Justice Department, "they can be reinstated by court order if there is renewal of discriminatory practices." So Whoopi should sleep well knowing she will not lose her right to vote and next time should research her facts before scaring a national audience.